In its first-three orbit mission, ISRO launched the PSLV-C45 at about 9:27 hours on Monday, April 1 from the second launch pad at Satish Dhawan Space Centre in Sriharikota in coastal Andhra Pradesh. 17 minutes and 12 seconds after the lift-off, India's first electronic surveillance satellite, EMISAT, was injected into a 748 km sun-synchronous polar orbit. 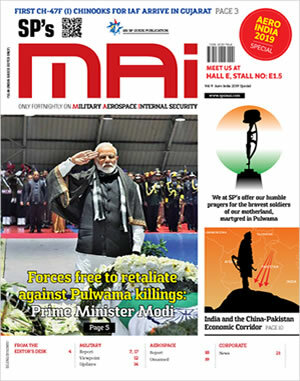 Indian Space Research Organisation's (ISRO's) third generation spark plug, PSLV (Polar Satellite Launch Vehicle), which took its 47th flight on Monday, also carried 28 other nano satellites from foreign customers along with EMISAT in the mission among which were satellites belonging to the US, Lithuania, Spain, and Switzerland. 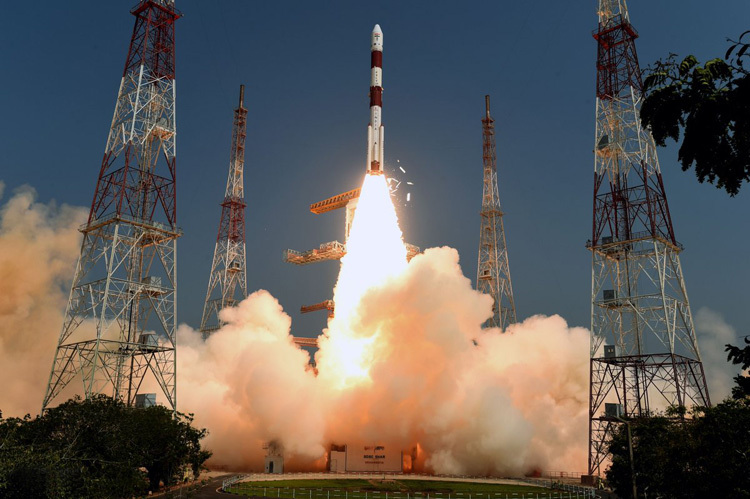 PSLV which took its 47th flight on Monday, also carried 28 other nano satellites from foreign customers along with EMISAT in the mission among which were satellites belonging to the US, Lithuania, Spain, and Switzerland. Alongside being the first three-orbit mission, this was also the first one to put solar panels in rocket fourth stage (PS4) and the foremost undertaking of PSLV-QL, a new variant consisting of four strap-on motors each of which carries 12.2 tonne of propellant for lift-off. Weighing 436kg and meant for aiding the local radars, EMISAT is based on ISRO's Indian Mini Satellite-2 (IMS-2) bus platform. Now moving in the 485 km orbit, PS4 carries payloads that will gather data over the next six months. The three payloads established for varied applications carry an ISRO test on Automatic Identification System (AIS) related to tracking ships on sea, an Automatic Packet Repeating System sent by AMSAT or the Radio Amateur Satellite Corporation which is believed to help radio operators receive improved accuracy in tracking and monitoring locations, and an Advanced Retarding Potential Analyser for Ionospheric Studies set up by the ISRO's university, the Indian Institute of Space Science and Technology. Aimed at measuring electromagnetic spectrum, the space shuttle's electronic intelligence (ELINT) could also add another dimension to the awareness and trailing activities of the forces. While there has been no such indication from ISRO or DRDO (Defence Research and Development Organization), the situational timing of the launch and the purposes of the three experiments on this orbital platform are being linked to serving military assistance as well. Alongside being the first three-orbit mission, this was also the first one to put solar panels in rocket fourth stage (PS4) and the foremost undertaking of PSLV-QL. After separation, the two solar arrays of EMISAT were deployed automatically and the ISRO Telemetry Tracking and Command Network at Bengaluru assumed control of the satellite. In the coming days, the satellite will be brought to its final operational configuration, stated ISRO. Post an hour and 55 minutes of the lift-off, the last customer satellite was put into its assigned orbit and post 3 hours, the vehicle's PS4 was transferred to a lower circular orbit of 485 km following two restarts to establish it as an orbital platform for performing experiments with the three payloads. The three payloads established for varied applications carry an ISRO test on Automatic Identification System (AIS) related to tracking ships on sea, an Automatic Packet Repeating System sent by AMSAT or the Radio Amateur Satellite Corporation which is believed to help radio operators receive improved accuracy in tracking and monitoring locations, and an Advanced Retarding Potential Analyser for Ionospheric Studies set up by the ISRO's university, the Indian Institute of Space Science and Technology. The PS4 was restarted four times during the mission owing to the use of a multiple-burn technology, where the engines shuts and restarts multiple times within a short duration allowing the rocket to pursue to the next orbit with the payloads. This was one of PSLV's longest missions around the Earth. The preceding longest one was of the PSLV-C40 in January 2018 that lasted for 2 hours and 21 minutes. The multiple-orbit mission was seen by 1200 people from the new viewers' gallery set up at Sriharikota, another first of the incident. The final and fourth stage of the rocket will stay alive for the next 6 months. ISRO also mentioned that in its next mission, PSLV-C46 will launch RISAT-2B in May 2019.